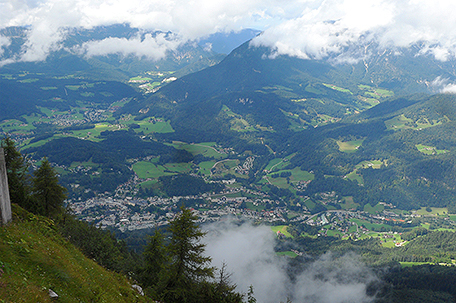 The walking tour of the picture perfect alpine village of Berchtesgaden takes you through winding streets and pass classical alpine architecture and chalet-style homes with decorative balconies complete with flower filled window boxes. Buildings within the city’s center are prime examples of Bavarian architecture, many featuring colorful luftimalerei, three dimensional frescoes depicting scenes of traditional village life. Of particular note is the one painted on the Hirschenhaus, the earliest example of a secular fresco. An average family is shown engaged in daily activities with their one “odd” feature being the fact that they all have the faces of monkeys. Legend has it that after learning that he would not be fully compensated the artist altered their original human faces. Ramsau is a tiny, incredibly picturesque, hamlet six miles from Berchesgarden and about 24-miles from Austria. Established as a stop for salt traders traveling between Germany and Austria as early as the 1200s, it became part of Bavaria in 1810. The parish church of St. Sebastian is one of the most photographed and celebrated sites in Bavaria. Joseph Mohr served as a priest at the church for a brief period of time. 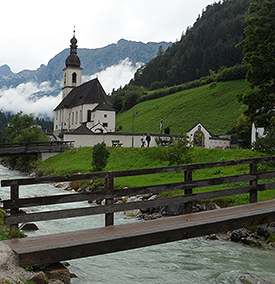 He went on to write the lyrics for “Silent Night,’ most believe inspired by the Ramsau Parish Church. This 1512 baroque church is situated against a stunning mountain backdrop. St. Sebastian is recognized for its onion-shaped spire topped with a six pointed German star. The church cemetery is filled with beautifully carved wooden cenotaphs that are adorned with candles for Christmas. At the close of WWII General Eisenhower visited the church, found it profoundly lovely and painted it. An interior tour showcases wooden sculptures of Christ and the 12 apostles and handcarved pews. A short walk takes you to the Zauberwald or Magic Forest. The forest has been named one of three of “Bavaria’s most beautiful geotpes.” There is a path that takes you through the forest and interpretive information on the flora is along the route. This is the enchanted setting of every fairytale you were ever told. Lake Hintersee is one of at least 24 lakes in the immediate area. A path allows you to circumnavigate the mountain lake. During the 19th century painters visited the area to paint the spectacular scenery. Nestled on the shore is Guesthouse Auzinger, one of the oldest mountain inns in Bavaria and what may be the oldest traditional restaurant in the region. The current proprieters have owned it since 1591. From here you get good views of the Watzmann, third highest mountain in Germany and Hochkalter Mountain, the northernmost glacial mountain in he Alps. The north face of Hochkalter is home to the 5,512-ft. Blue Ice Glacier. Lake Königsee, the deepest lake in the Alps and offers access to the internationally renowned St. Bartholomew Church, by boat. The Prince-Provosts erected the pilgrimage church in 1134. The church has two onion-domes and an interior designed after the Salzburg Cathedral. The lake, within Berchtesgaden National Park, is 1,975-feet above sea level. Berchtesgaden Salt Mine hosts one of the most fun and unique tours, The Salt Time Journey, in the world. The mine opened more than 400-years ago and thereafter the area was sustained by mining the white gold. This 1-hour creative tour immerses you in the history and inner workings of salt mining. Timed tickets grant visitors access to an area where they are given miner’s overalls to put on over their clothing. From there they are seated on a train that takes them deep inside the mountain. A guide provides historical information in German but audioguides are available in all the major languages. There are a series of rooms that relate all aspects of mining through use of audio and video presentations. On two occasions visitors use the miner’s slide to glide into the next gallery. The ride is fun and easy but there is also a walking path. Near the end of the tour guests climb aboard a ferry to glide across Mirror Lake complete with illuminated underwater formations, light show and dreamlike music. As if that were not enough, a funicular takes visitors back to the surface. The tour is accessible to most people with mobility issues. Because of the spectacular mountainous terrain one of the must-do things is to travel along the impressive roads that comprise some of the world’s most impressive drives. Rossfield Ring Road attains an elevation of 5,600-ft. There is a parking area that provides unparalleled scenic views. One of the oldest roads in the country is the German Alpine Road and the regional portion travels through Berchtesgadener Land. Eagle’s Nest Road, Kehlsteinstrasse, takes visitors from Obersalzberg to Hitler’s Eagle’s Nest. This engineering marvel was completed in a mere 13-months, into the mountain, with five tunnels and only one hairpin turn for the entire road that rises over 2,000-ft. It was restricted to invited guests and staff members only during the Nazi Regime. The 4.5-mile single lane section of road that takes you to the Eagle’s Nest at the summit of the mountain was completely closed to the public in 1952 for safety reasons. At that time buses designed for mountain travel became the only sanctioned method of transport for the 20-minute ride. Visits begin on a plateau on the lower level where timed tickets can be purchased and you can orient yourself to the era and the place at the Documentation Center Institute of Contemporary History in Bavaria. I strongly success you begin there. The center opened in 1999 to document and interpret regional history in general and Hitler’s rise to power and his time spent there specifically. Tours of the Documentation Center begin in the foyer with a model of the area during the Third Reich. Hitler began coming to the region in 1923 and staying in a rented home. Approximately six months after he became Reich Chancellor he purchased Wachenfeld House and from 1933-36 he had it reconstructed and turned into his private residence, the Berghof. Hitler spent more time at the Berghof headquarters than he did at his headquarters in Berlin. Many of his war policies were created here and it was a pilgrimage site for true believers. The US took over the area in April of 1945. The house was bombed to prevent its from becoming a place of misguided worship. Hitler took over the entire area, offering the local mountain dwellers small amounts of money for their property. In many cases the land was hereditary and they did not want to sell but were “persuaded.” Three families continued to refuse and the landowners were imprisoned. After the war the people attempted to regain their land but only the three who went to prison could prove their land was confiscated illegally. Bormann, Goering and Speer had residences on the mountain to be near their Fuhrer. Speer’s home is the only one still in existence. The largest building on the mountain was the SS barracks. A model depicts the layout of the enclave. All of these buildings were blown up in 1952. On the second level the nine thematic galleries begin starting with the “Mystification and Cult of the Fuhrer.” They are designed to build upon one another, culminating with the “Second World War” and a bunker tour, and turn a glaring light and unblinking eye on a tragic history. Highlights of the exhibits are photographs selected from the more than 2.5-million taken by his official photographer, SS paraphernalia, propaganda items and the interpretive brochures are available in each gallery. The Obersalzberg bunker was constructed from 1943-45 and was never completed. The plan was to continue to govern the country from the bunker, Hitler’s underground headquarters, should the surface buildings be compromised. Tours are accessed through the museum and include only a portion. There were more than 100 rooms, an elevator for cars and was as deep as 115-ft. Rooms are sparsely furnished but signs indicate their original use. On Hitler’s 50th birthday, Martin Bormann, leader of the Party Chancellery and private secretary of Hitler and the National Socialist Party, gifted him with the Kehlsteinhaus at the crest of the mountain, referred to after WWII by Americans as the Eagle’s Nest. It was used as a guesthouse for visiting dignitaries with a still functioning tearoom. While riding the bus to the Eagle’s Nest a narrative is given in both German and English. Upon arrival visitors should proceed directly to the 406-ft. tunnel that takes you inside the mountain to a marble, circular, foyer that opens onto Hitler’s private elevator. A three ton plaque over the entrance indicates that the tunnel was constructed in 1938. On a 41-second ride, the gleaming brass elevator travels an additional 406-ft. upward and into the building. The interior of holds 53 people and once had leather benches or seating. Once there was a second car below the main elevator for guards and supplies. A third, much smaller, emergency elevator, runs in a shaft adjacent to the ornate one. A highlight of the interior self-guided tour is the tearoom’s Italian marble fireplace, a birthday gift from Mussolini. The view from the veranda is outstanding and visitors may recognize the setting from film clips in various documentaries. Hitler visited the Eagle’s Nest only six or seven times. He was afraid of heights and the vulnerability of being bombed by the allies. I wish you smooth travels! 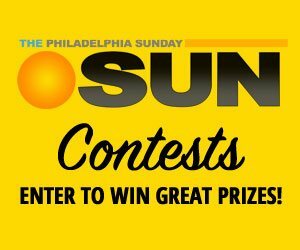 What is new at the Franklin Institute? Gunther Von Hagen’s BODY WORLDS: Animal Inside Out will open to the public on October 4th. The exhibit will allow visitors to view animals and obtain a close up view of their circulatory systems, muscles and skeletons as well as learn about each species. This unprecedented exhibition will be presented until April 12, 2015. Please not that no animals were killed or in any way harm for use in this exhibition.